Choosing new siding for your home can be a challenging task, but taking into account maintenance, cost of ownership and beauty there is no comparison to natural Western Red Cedar. Real Cedar siding instantly elevates your home to another level of warmth and beauty. You can't get that with the plastic substitutes. Try as they might, the look, the feel and the scent of natural wood just can't be duplicated in a chemistry lab. That's why synthetic siding always ends up looking a little on the cheap side - odd, considering composite materials actually cost more than Real Cedar. Western Red Cedar siding is naturally resistant to rot, decay and insect attacks. Which makes it incredibly low maintenance whereas the so-called "low maintenance" composite materials require more upkeep because they don't have any natural defenses against things like mildew. As well, plastic substitutes are susceptible to fading due to sun exposure - only unlike Real Cedar; composite materials can't be restored or refinished once their color has faded. So if you want siding that lasts decades and just keeps getting better with age, then Real Cedar's the way to go. Concerned about the environmental footprint your siding product will leave behind? With Real Cedar, you can take heart in knowing you're using one of the most sustainable building materials available. It produces the least greenhouse gas, air pollution, water pollution and solid waste. Not only that, Western Red Cedar lumber is harvested from the most sustainably managed forests in the world. So you can feel good about your wood. Cha-Ching! That's the sound of money you can save with Real Cedar siding. Not only does it cost less up front than composite materials. 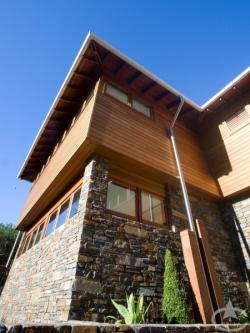 But thanks to its low density, Western Red Cedar is a natural thermal insulator. So if you want siding that doesn't just look great, but also keeps your heating and AC bills down, the choice is clear. Wood is actually very porous and filled with air within the cell structure, which means it is good at keeping cool in the summer and warm in the winter. The density of wood directly relates to thermal conductivity, or how much heat is transferred through the material. Since Western Red Cedar is a light, low-density material it is one of the best thermal insulators amongst other commonly available softwoods. According to the Western Red Cedar Lumber Association (WRCLA), it has a coefficient of thermal conductivity (k value) at 12% mc of 0.74 BTU inch/ft2h degrees F. The R value (the reciprocal of k) for Western Red Cedar is 1.35″ (34mm) of thickness.